On the list of not-so-obvious hiker food, baby food ranks near the top. Back at Lake Isabella, Shadow, a thru-hiker from Holland, sang the high praises of baby food. 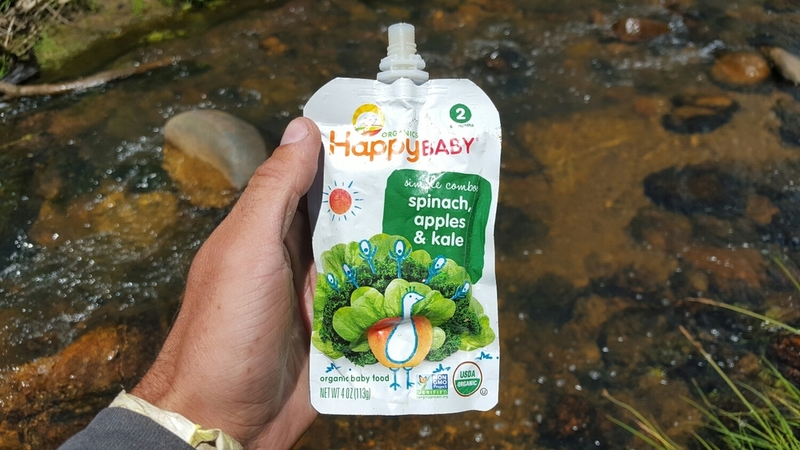 While the pouches are heavy, loaded with water weight, baby food delivers a full fledged punch of fruits and vegetables on the trail. We're talking spinach, oranges, strawberries, beets; that kind of stuff. No matter where you twist the top off, you're getting all the juiciness of home, even in the desert. And that's HUGE! Heading out to the trail tonight I expect to cover 130 miles before the next town, Mammoth Lakes. The hike should take me 7-9 days, so I'm not packing out baby food this time. But don't let that sway you from considering packing out baby food on your next hike.